Plumbing and heating problems can happen at any time. Here are a few tips for keeping your plumbing, heating and drains working their best, and learn what to do in case of a plumbing emergency. Remember, preventative maintenance is the best approach to keep your systems operating at peak efficiency. Keeps your plumbing and heating working as expected, for comfort, safety and peace of mind. Avoids buildup that may otherwise result in costly damage and repairs. Helps to preserve the value of your home or business. WHAT TO DO IF YOU HAVE A PLUMBING EMERGENCY - and how to avoid one for frozen pipes? There are things you can do that can make a difference. For the whole house, find the main shut off valve, usually located in the basement (near where the water main enters the building. This is usually on the side of the building facing the street, or facing your well if you have a well). If you have a bar-type shut off, when it is in line with the pipe the water is allowed to flow. To shut the valve, turn it 90 degrees clockwise so it becomes perpendicular to the pipe. If you have a round-type shut off, rotate it clockwise until it is closed. After the valve is shut, release the pressure in the pipes by opening faucets and allowing the water to flow until the water stops. After closing the shut off, release the pressure in the pipes. You can do this by opening faucets to allow water to empty from the pipes until the water stops flowing from the faucets. For a toilet, the shut off is typically located at the back of the toilet with a round-type shut off. Screw the valve clockwise to shut the water supply. For a sink, the shut off is typically located under the sink, with a round-type shut off. Screw the valve clockwise to shut the water supply. Anywhere there is poor air circulation or unheated space, wrap pipes with preformed insulation. As a temporary solution, run faucet slowly, using a faucet that is furthest from the water main. Drain outdoor pipes and winterize before cold weather. This can be done by turning off the water supply to those outdoor faucets then allowing the faucets to drain out any remaining water. IS IT TIME TO REPLACE YOUR WATER HEATER OR HEATING SYSTEM? Don't wait to find out the hard way - examine your water heater on a regular basis and you may be able to avoid a catastrophe. How old is it? Each heating system model is rated for its expected lifetime. Check with the manufacturer's recommendation for your model and where the date information is noted. For most models, replacement should be considered after 16 to 20 years. Date of manufacture is usually located on a sticker on the inside panel of the heating system. Does it need repairs often? A system in good working order should only require regular maintenance. Is it making unusual noises? Notice whether the system is turning on and off more frequently, which could indicate inefficiencies in the system or airflow. Are the utility bills going up? Unless there is a big difference in the local weather from previous months or years, the heating costs should be fairly consistent given a properly functioning system. Unusual utility costs could be an indicator that a problem exists. For gas heaters, what color is the flame? Gas heaters should have a blue flame. If the flame is yellow or flickering, or if there are other signs such as soot streaks on the furnace, no updraft in the chimney, or excess moisture throughout the home, your furnace could be producing carbon monoxide. If you encounter any of these, it can be a dangerous situation and you need to have it evaluated immediately by a professional heating system service. Consult a licensed professional for replacing the heating system. The first letter represents the month (e.g. if it is a D, being the fourth letter of the alphabet, it means April, the fourth month). Is the hot water rusty? This can be a sign that your water heater is rusting away on the inside and it may begin to leak soon. You can test this out by draining fifteen gallons of hot water out of the water heater. If after this the hot water is still coming out rusty, the water heater may need replacing. Is it less effective, or is there rumbling noise from the water heater? The issue may be from sediment build up on the bottom of the tank. This makes the water heater less efficient and can cause more wear on the inside of the tank. Is there water around the base of the water heater? If you are certain that leaks are not coming from fittings or connections, water may be an indication of possible fractures in the tank. As the tank heats, the fractures can open up. As the tank cools, the fractures can close again. Water from a leak means it's time to replace the tank. Consult a licensed professional for replacing the water heater. 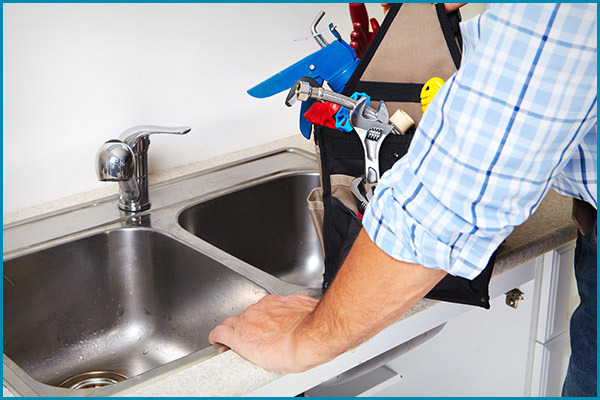 Having problems WITH general household plumbing? Slow Drains? Leaky Toilet? There are things you can do before a professional may be needed. Unclog a Slow Drain - Safely! For a sink or tub drain, slow drains can be from hair, mineral deposits and soap build up. Unscrew the drain cover, if possible, and clean it. Use a drain snake wire in the pipes to help detect and loosen blockages. For a sink, plug the overflow drain hole with a wet towel to help create better suction. For sink or tub, use a plunger to help loosen the drain contents. This can loosen what might otherwise be unreachable blockages or to loosen basic blockages. For a total blockage, you need to contact a professional. We can help solve your problem safely and effectively. Be mindful of what you put down drains to avoid problems in the future, and avoid pouring chemicals down the drain. Regular maintenance can help. Turn off the water to the toilet, then flush the toilet to empty the toilet reservoir. May need to flush more than once. Check the rubber flapper in the toilet tank to ensure it has a proper seal when closed. Over time, harsh chemicals can break down the effectiveness of the rubber flapper. The rubber flapper can usually be replaced using replacement parts available at most hardware stores. Occasionally, manufacturers may also recommend replacement parts if there are known issues with a particular product. Make sure the water level in your toilet tank is at the right height for your fill valve (i.e. make sure the water level isn't too high). Adjust the height of fill valve if needed. The water level should be just below the top of the fill valve when the toilet itself has enough water in it. Unnecessary water leaking can be costly. If these basic home fixes do not solve your problem, a professional plumber can help.